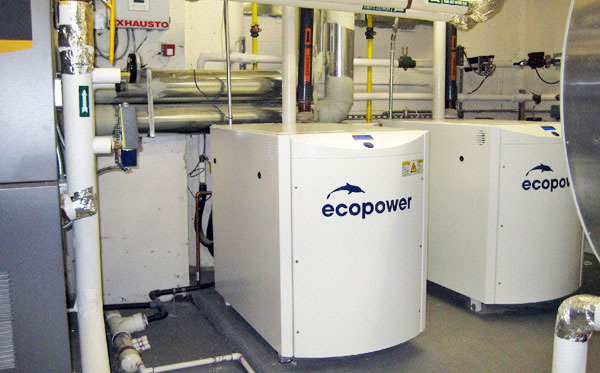 The ecopower® provides heat and electrical power in a cost effective and environmentally friendly manner. This innovative system utilizes advanced cogeneration technology, helping create the future of energy production on the residential and commercial scale. High overall efficiency and lower emissions compared to central power plant output are major benefits of microCHP. A key element in making the ecopower® microCHP system work efficiently is having adequate demand for heat and/or hot water. The ecopower® works in forced air heating applications and hot water derived heat (boiler and hydronic delivery system). Domestic hot water, swimming pools, etc., can be heated by the ecopower® as well. For residential and commercial operations that have high electrical energy requirements and heat demand, the ecopower® microCHP is the perfect solution. The ecopower® is most effective in applications where heat needs are greater. The logic here is that the longer the ecopower® runs, the more payback is achieved from the amount of electricity generated. Apartment Buildings – Providing domestic hot water to tenants or heating with hot water boiler based systems. Many include “free Heat and Hydro” This unit is ideally suited for this application. For example, a 20 x 40′ hotel pool would require 30,000 BTU/hr (based on heat loss calculations at 10 °F air/water variance and an indoor pool) to maintain the water temperature at 75 °F. If ecopower® were to supply heat for that requirement, it would also generate 2.3 Megawatt Hours of power in one month. •This electrical energy is very low cost because the pool would be normally heated by conventional means (a boiler). This electrical offset would be even greater when the domestic water need and laundry requirement are added to the equation. •The electricity generated would be consumed on site to reduce the amount paid to the utility. If any excess, the power not used would be sent back to the grid for credit on the next bill (for Net Metering utilities). Greenhouses – For hot water in-ground piping or utilizing a fan/blower system. Restaurants – Electrical use and hot water requirements are high. For instance, truck stops where 24 hour operation is common and dish washers run continuously and electrical usage is significant. Laundromats – High hot water use and electrical demand. Car washes – Hot water use and electrical use for lighting.